Worldwide is well known for our Secure-Moor® brand of mooring chain, hardware, anchors and buoys. Also a distributor of domestic marine anchor chain and shackles, swivels and other fittings we can help with your boat moorings from bottom to ball; mooring anchor, bottom chain, swivels, shackles, top chain and buoy. At Worldwide Enterprises, we stock a large inventory of marine anchor chain and other mooring tackle and marine hardware all year long servicing the east coast, Lakes Regions and the Caribbean. 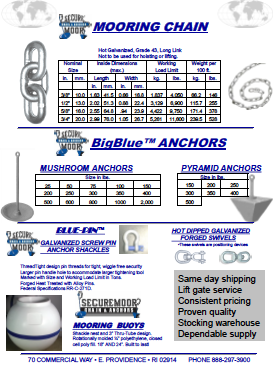 Please contact us if you need more information about our marine anchor chain, long link mooring chain or other mooring tackle. Many other chains available; proof coil, high test, stainless steel. Secure-Moor® Mooring chain grade 43 has long links to accommodate a shackle at any point on the chain. Used for mooring boats or buoys to Secure-Moor® mushroom anchors, Secure-Moor® pyramid anchors, etc. in. mm. in. mm. in. mm. kg. lbs. kg. lbs.